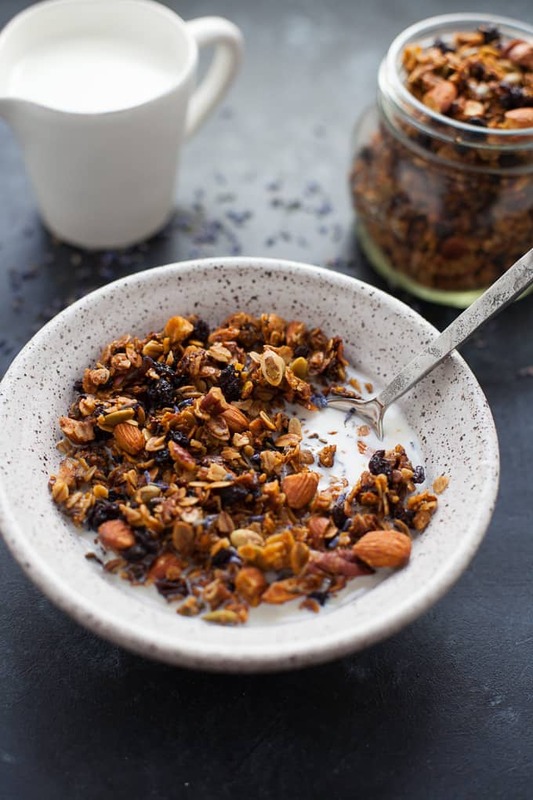 Floral and reminiscent of springlike temps that are hopefully on their way, this lavender granola is perfect paired with milk, yogurt, or just eaten straight out of the jar! It’s funny, well actually, it’s kind of sad, I used to never buy granola. I never bought granola because it was always listed in articles titled “healthy food that’s surprisingly not so healthy for you.” I started to believe that it contained too much added sugar and so I never bought it. It’s sad because I really do like granola. I love its satisfying crunch. I love all of the different textural components like the toasted oats, the crunchy nuts and the chewy dried fruit. And I relish that it adds more satisfaction to other foods I enjoy like yogurt. Yogurt to me is so much more enjoyable with some crunch on top. Otherwise, it’s just a boring cup of smooth and creamy. Learning how to eat intuitively forces you to take a long, hard look at all those foods you previously deemed “bad” or “off-limits.” Not that granola was ever completely off-limits for me but I wasn’t really seeking it out either. 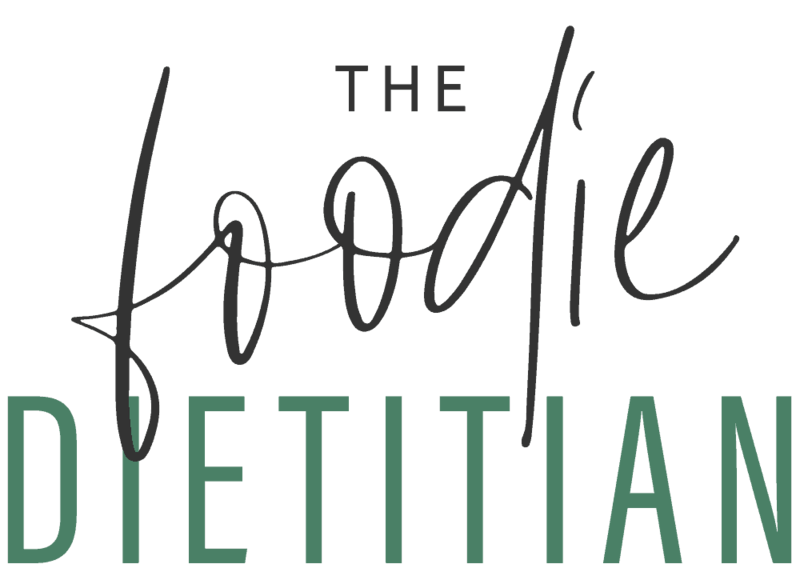 Intuitive eating invites you to challenge your previously-held thoughts and beliefs around food, and by challenging those diet-mentality beliefs, I was able to see granola for what it was, just granola. And I was able to see how it was a “healthy” food for me because it added satisfaction to meals and snacks and I really enjoyed it. When we judge a food based on one thing whether it be grams of this or that, we take a very narrow approach to our view of health. When we step back and look at the larger picture, we can see how simply the enjoyment of a food is health-promoting. If we’re miserable day in and day out eating “super healthy” foods, what is that doing for our mental and emotional health? 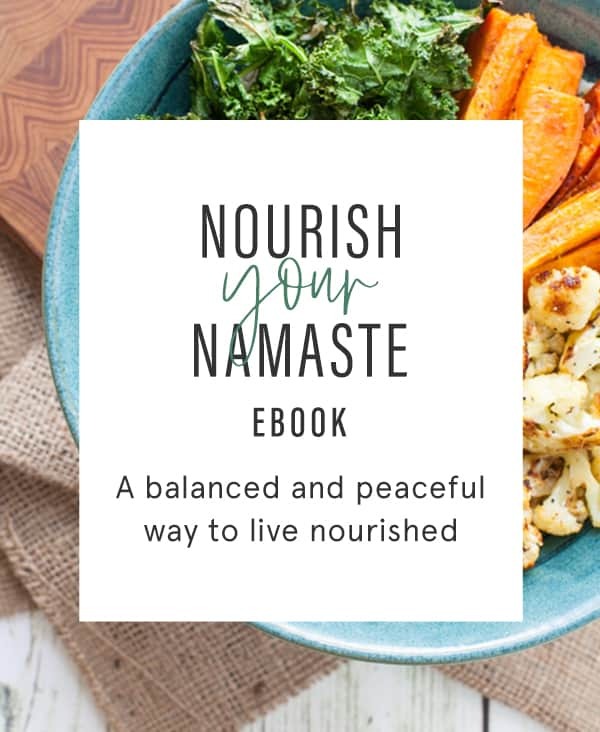 I think it’s important that if we’re telling ourselves we’re taking certain actions in the name of health, that we get really clear about our definition of health. Because often when we’re talking about food, nutrition and exercise, we’re only talking about physical health. Does your definition of health include mental and emotional health? Are there any behaviors you’re practicing now in the name of physical health that are hurting your mental and emotional health? 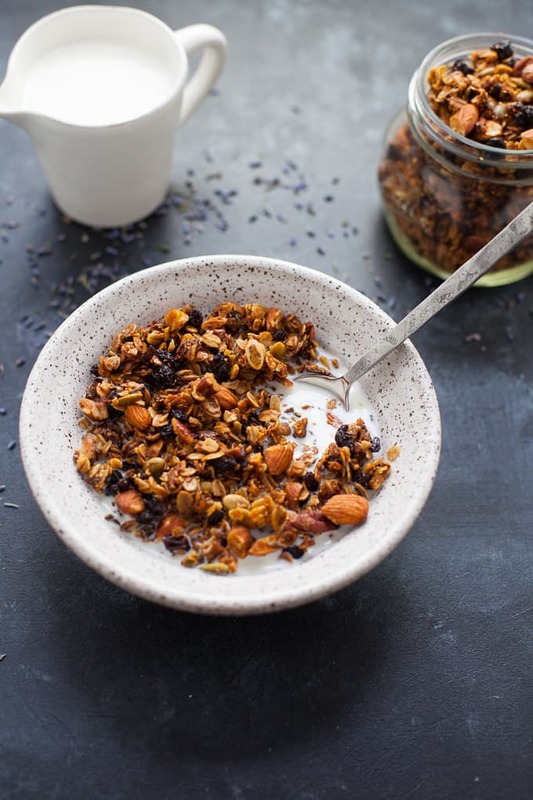 For me, I’ve got two large jars of this lavender granola sitting at home right now so I’m feeling pretty happy about that. I’m also really digging culinary lavender right now (as you may have guessed from my recent lavender latte) probably because it’s spring in Boston but it still feels like winter and so I’m searching for signs of spring that are not outside my control, i.e. spring-like foods and flavors. Hopefully the more lavender I consume, the more Mother Nature will get the hint it’s time to move on :). 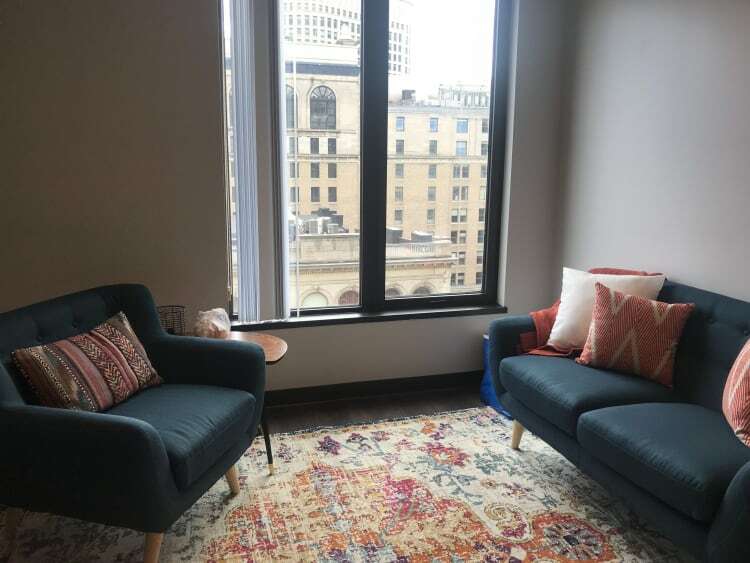 Also, on a personal note, I moved into a new office space in Back Bay in Boston for my private practice! 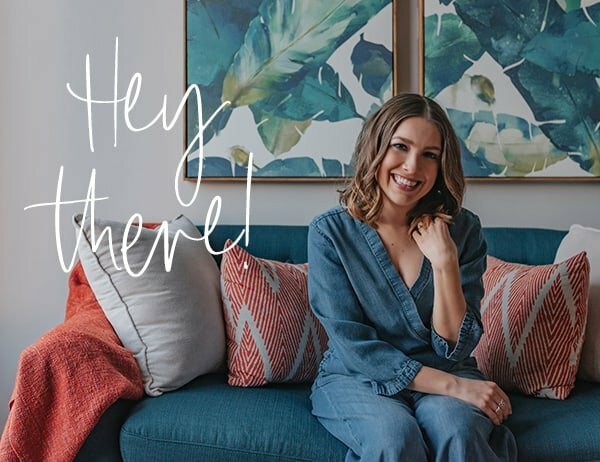 I’m so, so happy because it’s been a long journey to me finding an office space that includes too long of a story to tell of personal identity theft (no, not mine, thankfully). Anyways, it feels SO good to finally be in a space that feels like home. And to invite my clients into that. If you’re a clinician in Boston, I’m looking for one more subletter for the space, so feel free to reach out! 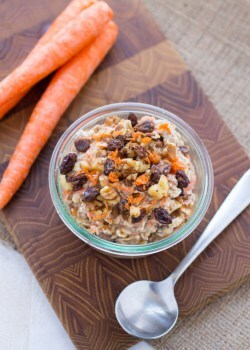 In a large bowl, mix together oats, almonds, pecans, pumpkin seeds, lavender and salt. In a small bowl, whisk together coconut oil, honey and vanilla. Stir liquid mixture into the dry ingredients until evenly coated. 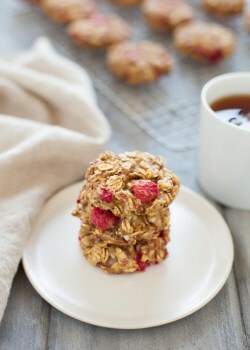 Turn granola mixture out onto baking sheet and bake for 40 minutes, checking every 15 minutes or so to stir. Stir in currants and let granola cool before serving (it will continue to dry out as it cools). 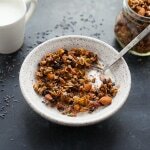 Tell me, what is your favorite way to use granola? 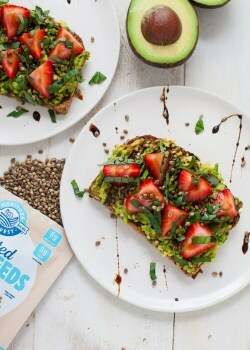 For more spring-inspired breakfast (or snack!) ideas, check out my recipes below! Good morning! This recipe is great. Just wondering, what is a typical serving size? Thanks, Haley! 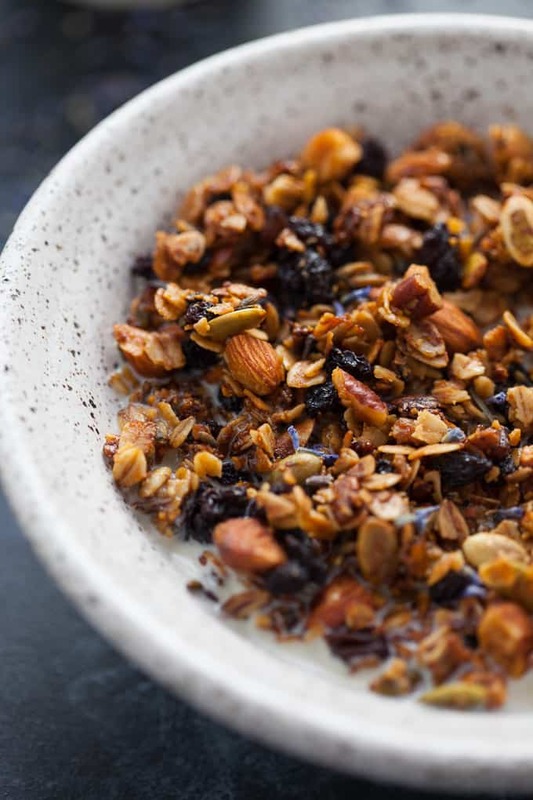 A typical serving size for granola is 1/4 cup. 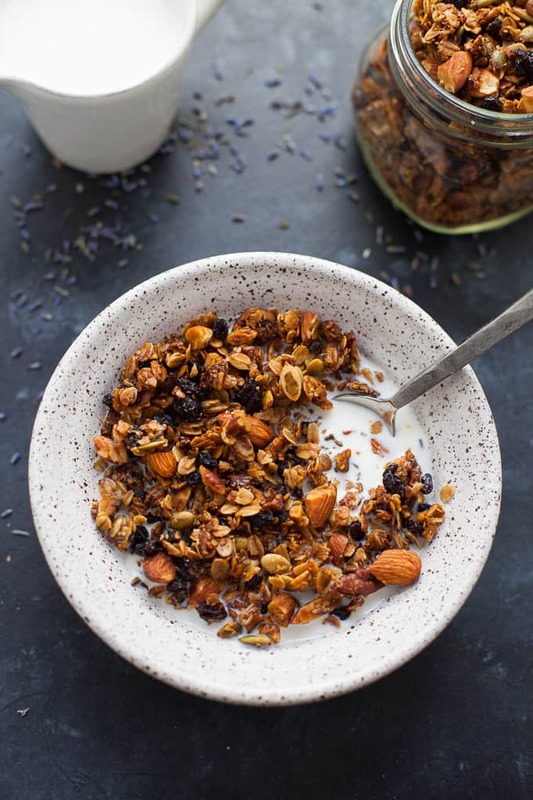 I would have never though to put lavender in granola, but now I know I’ve been missing out! It looks and sounds delicious!